Paper towels are great for absorbing your kitchen spills, but did you know that they're also perfect for cooking bacon in the microwave? Simply place bacon side-by-side on a layer of two paper towels and place two more paper towels on top of the bacon. Zap in the microwave at 1-minute interval for 3-4 minutes until desired crispiness is reached. No greasy pan-cleaning to worry about afterwards. Other than easy bacon-cooking, paper towels are also great for removing silk from corn, softening your rock-hard brown sugar, cleaning your sewing machine, keeping your cast-iron pots rust-free, and testing the shelf life of your old seed packets. Not bad for a humble kitchen accessory commonly used for wiping orange juice puddles from the kitchen counter. 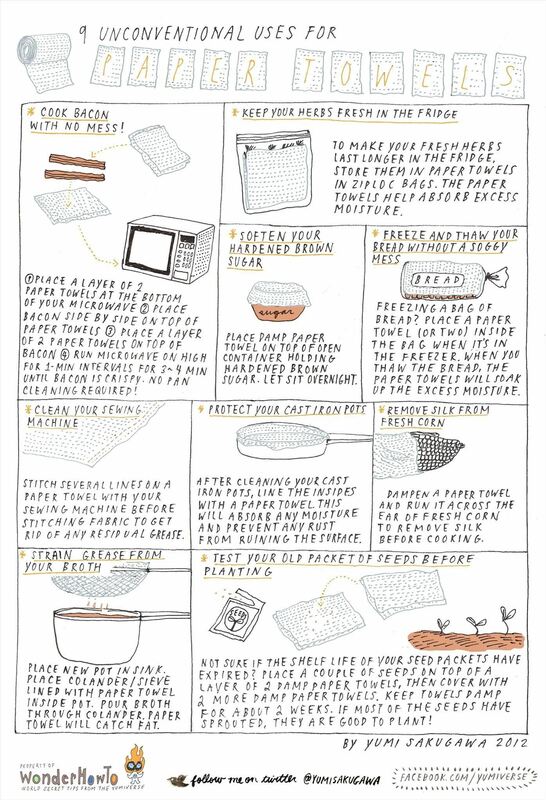 Got your own unconventional uses for paper towels? Share with us by commenting below!